Objectives: To study the morphometric parameters and levels of expression of serine racemase in the rat hippocampus after repeated gravitational overloading in the caudocranial direction (–9 Gz). Materials and methods. Rats aged 12 months were subjected to a force of 9 G for 5 min twice a day with 12-h intervals for 28 days (group 2; gravity; n = 10). Rats not exposed to hypergravitation constituted group 1 (controls, n = 10). The morphometric mean areas of the nuclei and perikarya of pyramidal neurons were determined, along with the specific number of neurons with signs of damage and the relative areas of the perikarya of pyramidal neurons and the neuropil. Immunohistochemical studies addressed the level of expression of serine racemase in all zones of the hippocampus. Results. Signs of impaired circulation in the microcirculatory compartment were seen in the form of spongiosis, thickening of capillary walls, and diapedesis of erythrocytes. 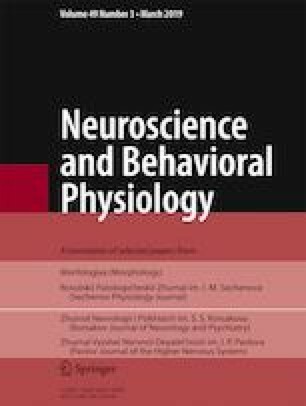 All zones of the hippocampus in experimental rats showed sharp increases in the numbers of pyramidal neurons with signs of damage. Atrophic changes were identified, consisting of reductions in the mean and relative perikaryon areas of neurons. Immunohistochemical studies demonstrated increased expression of serine racemase in field CA1, along with translocation of reactive material into the processes of pyramidal neurons. Fields CA3 and CA4 showed a tendency to decreases in serine racemase contents. Conclusions. Prolonged gravitation in the caudocranial direction produced signs of marked damage in all hippocampal fields in rats, combined with enhanced expression and accumulation of serine racemase in the dendrites of field CA1 pyramidal neurons, which may be evidence for the involvement of excitotoxicity in the mechanisms of secondary damage in these zones. Translated from Morfologiya, Vol. 153, No. 1, pp. 16–22, January–February, 2018.